Born: April 6, 1483 in Urbino Italy. Died: April 6, 1520 at age 37 in Rome, Italy. Raphael was an artist and architect during the High Renaissance. Raphael Sanzio was a famous artist and architect during the High Renaissance. Sanzio grew up with an artistic background, as his father was a court room painter. Due to all of the time spent around the father's noble work, Raphael developed very good manners and social skills to set him apart from the rest. His mother died when he was only 8 years old and his father died 4 years later. Raphael was then orphaned and lived with his uncle who was a priest. Raphael was a very productive worker-- he ran a workshop with 50 pupils and assistants. This was only the start to his career. Sanzio went through three phases of work: his early career, the Florentine period, and his last years. His early career consisted of learning and being influenced by other artists and educators around him. By 1501, Raphael was fully trained and considered a master of art and architecture. Through 1504-1508, also known as the Florentine period, Raphael moved to Florence, where he studied work and became inspired by established painters such as Michelangelo and Leonardo da Vinci. By 1510, Raphael was commissioned by Pope Julius II to paint his personal library. While doing so, he used four frescoes, or techniques-- philosophy, law, poetry, and theology. After Pope Julius passed away, the new Pope, Medici Pope Leo X, became good friends with Raphael as well and continued to give him more commissions as well. In 1503, Raphael painted Galatea which was based off mythology and included Da Vinci's "triangular composition" which proved that Raphael was highly influenced by others of his time. From there Raphael was given commission to design St. Peter's Cathedral, however this was never actually carried out. Raphael was made "Groom of the Chamber" which meant he waited by the Pope to help him. He was basically a best friend of the Pope. In addition, he was made the knight of "Papal Order of the Golden Spur" meaning he contributed to the glory of the Catholic Church. Both of these promotions lead to a bigger income for Raphael Sanzio. Raphael was supposed to marry his fiancee, Maria Bibbizena, but never followed through. After considering becoming a "Cardinal," and if so, he was within the chuch he could not marry. Others said maybe he never really loved her. In 1520, Raphael completed his last painting, The Transfiguration, but died shortly later at age 37. His death was by fever as the doctors gave him the wrong cure. An extremely grand funeral was held for him and he was finally burried at the Parthenon. 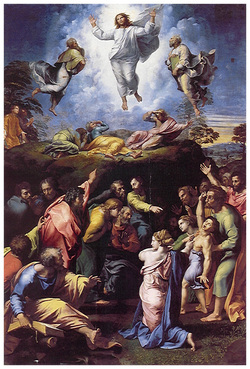 In this painting created by Raphael Sanzio, it is a replication of the Transfiguration. The person in the white in the middle is Jesus. Jesus is floating between moses and elijah. The people below are the apostles reaching out to Jesus. This painting shows a connection between God and his people. The cave was drawn to symbolize Renaissance style. The painting was also done in a Renaissance style because the painting shows movement. The apostles at the bottom seem to be moving and reaching out to jesus. Also, the detail in the bodies of the people are very realistic. Their faces show expression. Shading and color was used to enhance details. For example, Jesus is in all white which seperates him from all of the other figures in the painting. This helps represnent that Jesus was the most important person in this painting. This painting shows that the Renaissance was a time of art. The people of the time period before the Renaissance and Reformation did not focus on humanism when painting portraits or pictures of faces. The people in this time period were the first to study the human body and began to put more detail into their paintings. They really focused on making their paintings look realistic. They finally began focus on 3D painting unlike the people of the Reformation time. This painting displays both humanism and it has an element of 3D. This painting particularly was created to express a connection between God and his people. For people of the Renaissance and Reformation time period, art was an important part of life. Being illiterate was not an easy thing, so paintings with extreme detail like so could really help people who could not read and write. "Raphael Sanzio Biography (1483-1520) â Life of Renaissance Artist." Totallyhistory.com. Totallyhistory.com, n.d. Web. 06 Feb.